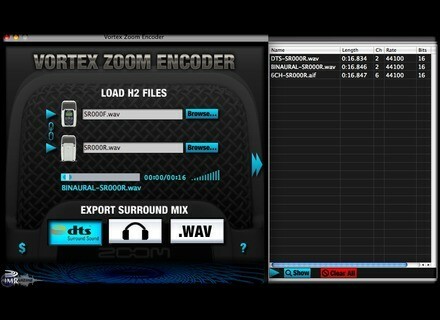 Vortex Zoom Encoder, Other Music Software from Immersive Media Research. Samson Technologies and Immersive Media Research (IMR) announced a software recorder for owners of Zoom's H2 Handy Recorder. The H2 is a handheld surround-sound recorder. With four built-in microphones, the H2 captures 360° sound into two stereo WAV files. IMR's Vortex Zoom Encoder, a program for Mac OS X and Windows converts the H2's dual-stereo recordings into standard formats. H2 owners drop the two stereo WAVs onto the Vortex Zoom Encoder window and click one of three export buttons: DTS, Binaural, or 5.1 WAV. DTS WAV: Users drag the 44.1kHz, 16-bit, 2-channel WAV files to a CD-burning program and burn a CD as normal. They then play this special CD through the S/PDIF output on a CD player, computer, or Sony PlayStation 3 into a DTS-compatible home theater system. The signal automatically expands back into glorious 5.1-channel surround sound. Binaural WAV employs IMR's proprietary ImmersiveStereo™ technology to convert surround-sound recordings. Users can transfer the resulting two-channel WAV files to portable players, burn them to audio CD, or convert them to compressed formats such as MP3 for more portability. 5.1 WAV is a six-channel, 44.1kHz interleaved WAV file. Users can drop these files into the Fraunhofer MP3 Surround Encoder(www.iis.fraunhofer.de/EN/bf/amm/mp3sur/index.jsp). MP3 Surround files are designed to be backward compatible: They play like normal stereo MP3s in standard players, but expand into 5.1 channels in MP3 Surround players such as Winamp. These 5.1 WAV files also load into many DAWs and video editing programs. 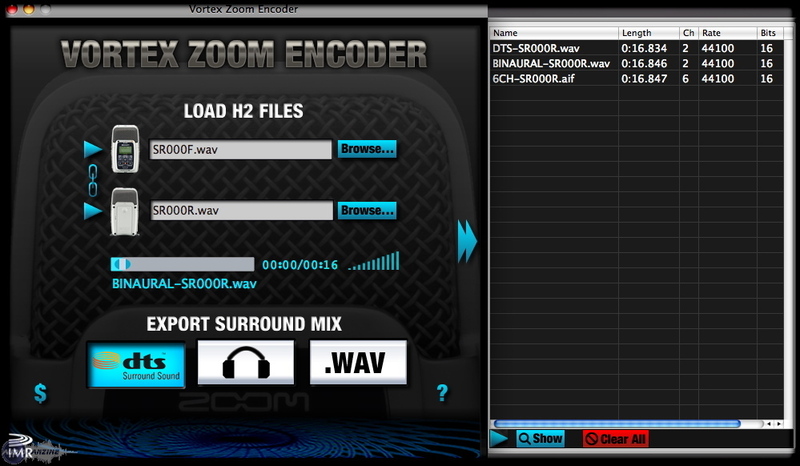 Vortex Zoom Encoder runs on Mac OS X and Windows XP/Vista. The program operates for 30 days and then reverts to a free player for Zoom H2 surround files, allowing users to hear their four-channel recordings through four speakers. Users can unlock and restore DTS, Binaural, and 5.1 WAV encoding for $25. For more information, visit their web site at www.im-research.com.